Thank you for visiting Skidgel Studios. My name is Cindy Skidgel and I'm an artist who enjoys working in many mediums, choosing to focus on the subject matters of nature and animals rather than one medium. ​I work in both flat and dimensional needle felted fiber art and my art glass work includes handmade beads, mosaics and stained glass. Recently, I've rediscovered my original love of drawing and painting and am currently working in watercolor and acrylic. My inspiration comes from many sources, but a strong one in my life is nature.The textures, forms, and colors from nature influence my work. I enjoy traveling to National Parks, and some of my favorites are in Utah and Wyoming. I hope to visit more in new locales to experience more of what nature has to offer. Animals are my constant inspiration and I especially enjoy learning about wild animals around the world as I incorporate them in my work. I inevitably end up watching documentaries of animals I'm working on through YouTube and I typically learn a lot of interesting things about the animal I'm creating. 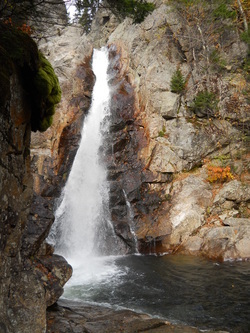 photo: Glen Ellis Falls, New Hampshire, Cindy Skidgel.